I love pancakes with crispy bacon and maple syrup. On paper, it is a really strange combination of flavours, but in reality one that just works so incredibly well. I have tried to come up with a healthy version of this traditional American breakfast dish and I just adore this adaptation. This is one of the most fabulous blends of flavours and textures I have tasted in a long time... delicate pancakes contrasting with soft, warm creamy banana and fragrant mango, combined with thin, crispy Parma ham and sweet, sticky maple syrup. It's an unbelievable 4 propoints (approx. 200kcal) per portion, which I think is a total bargain for this seemingly decadent dish. Start by preparing the fruit by peeling and cutting into chunky slices. You will need 2 slices of mango and 2 slices of banana per person. Allow 2 slices of Parma ham per person. 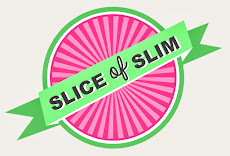 Trim any excess fat off the ham using scissors, then cut each slice in half lengthways. Carefully wrap each slice of fruit with half a slice of ham. Spray a griddle pan with Frylight Sunflower oil and fry the Parma ham-wrapped fruit slices, turning as each side browns. While the fruit is cooking, spray a small frying pan with Frylight Sunflower oil and heat it up. Make pancakes by drizzling about 1/4 cup mixture per pancake in a lacy pattern, leaving gaps in the pancakes. Make 2 lacy pancakes per serving. The pancakes are ready when they are a beautiful golden colour. Arrange two lacy pancakes on the serving dish. Alternate mango and banana across the pancakes. Finally, garnish with long, uncut chives and drizzle the fruit with 1 teaspoon maple syrup or honey per person. (Please use a measuring spoon to measure accurately as 1 teaspoon is 0pp whereas 2 teaspoons are 1pp). Tuck in and enjoy as a breakfast dish, light snack or dessert.